The goal of this course is to introduce a student to the fundamentals of recording, engineering, and producing music in a modern recording studio. The student will learn everything they will need to know in order to create and distribute their own music, including effective audio recording, MIDI sequencing, and crafting the perfect “mix.” The course will also introduce the student to subtractive synthesis, rudimentary music theory, mastering, and the various properties of sound. Upon successful completion of the course, the student will have a firm grasp on the basic building blocks of digital audio production inside the recording studio. The course consists of six one hour lessons spread over six weeks. 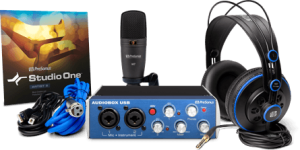 The student will receive a PreSonus AudioBox Studio recording package to complete with microphone, headphones, audio interface and Studio One recording software. This package is the students to use at home and to keep at the completion of the course. Week 5 – Mixing cont.